After a busy day running errands, when I got down to make dinner, I was rudely shocked to realise that I hadn't done any vegetable shopping yet for the week! To test my luck, I nervously looked into the refrigerator to see if I could find any veggies out there. To my disappointment, the refrigerator blankly stared at me. Looking into the freezer, I found the same old mixed vegetables, beans etc..and hidden somewhere deep inside was a package of Valor Lilva (I had a few onions and tomatoes). Frankly speaking, I think I mistook it (when buying at the store) for Surti papdi lilva which I use quite often. Only after I opened the package did I realise that they were a different kind of beans. Anyway I thought I could change the ingredients a little and make kurma out of those beans! I had noted down a few masala variations for different kurmas long time back after browsing few websites and also from friends. I interchangeably use these masala variations for various types of kurmas I prepare. One such is here and we enjoyed it immensely. In a hot pan, dry roast jeera, fennel and coriander seeds separately. Let them cool. After they cool down a little grind them into a fine powder. Make a paste of Sauteed Onions, chopped tomatoes, grated coconut, green chillis, coriander leaves and also the above mentioned powder(jeera-fennel-dhania ). In a heated sauce pan, add the remaining oil and fry cloves and cinnamon. Pour the above gravy mixture and let it boil. Add the required amount of water (I added about 2 cups). I also added vegetable juice at this point which is totally optional. Add turmeric, chili powder and mix well. Add salt and the thawed valor lilva and cover with a lid so that they get cooked well. After about 10 min check for the salt and spice levels and adjust according to taste. Let it simmer until the oil oozes out. Serve with rice/roti and enjoy the dominant fennel flavor in there mixed with the coconut flavor!! Sending to Divya who is hosting the 28th edition of My legume love affair, an event started by Susan of The Well Seasoned Cook. It has been quite a while since I prepared dosas at home. I have been using quinoa very often these days and I was kind of getting a little bored with the routine Quinoa Biryani and Masala Quinoa. Don't we all resort to 'culinary experiments' only when we get bored of the routine? In that frame of mind, I was thinking about how else I could use quinoa in our Indian style when I heard a friend mention about dosas with quinoa. Thats when I came up with this Multi grain dosa. I later came across many blogs where quinoa has been used to make dosas. One such blog is veginspirations.com. I am just about discovering the versatile nature of this wonder grain. And so I guess we could tinker around with the proportion of ingredients to get different textures. Here is how we ate dosas for breakfast. Soak all the top 6 ingredients for about 3-4 hrs. (Whole urad dal needs atleast 12 hrs of soaking time). Grind the soaked grains to a fine paste adding water as needed to make dosa batter. Add salt and mix well. The dosa tastes well if fermented for about 6-7 hrs but it is not necessary. (I tried both the ways and it didn't change the taste/texture of the dosas). This goes to Umm Mymoonah's 'Eat Well live well- heart friendly recipes'. I am looking for a sensor enabled, no touch trash can and I found one here. Also sending these Dosas to Priya's CWF-WG:Quinoa Event. We are slowly getting used to eating flax seed in our diet. Needless to say, I am sneaking in as much flax seed as possible through my baking experiments! This Apple Bread, however popular it might be is new to our family. And the first time I made it, we were floored! I have never tried baking apples and so this was a pleasant surprise for me when it turned out so good. As soon as S walked in from work, he smelt the aroma and raised a brow when I told him that it was Apple Bread. He wouldn't even wait for the bread to cool down - he went ahead and tried slicing it. Thats when it crumbled a little bit but we didn't mind as we finished it in a single sitting (No guilt - there was very little fat in there and we skipped dinner of course!!!) . My little one loved it very much too! Coming to the recipe part of it, I was inspired by a recipe here . I made a few small changes and most importantly I made it vegan. Note - Bread flour can be substituted with All purpose flour in this recipe. In a mixing bowl, add the flour, baking powder, baking soda and salt and mix them withour any lumps. In a spice grinder, powder the flaxseed and mix it in 3 Tbsp of water. In a blender, add sugar, oil, apple sauce, flaxseed paste and blend well. Slowly add the wet mixture to the dry ingredients. Make a soft batter mixing it gently. Fold in the diced apples until all the apple pieces are well incorporated in the flour. In a loaf pan lined with parchment paper, pour the batter and evenly spread it. Bake in the middle rack of the oven for about an hour. I took it out in exactly 62 min. Sending this to Champa's 'Bake off event Oct 28 2010' and also to 'Fruit in Baking' . After experimenting with Mango-Ginger pickle, I got back to using this wonder spice in the usual way, that is in a Dal. The taste of Dal completely changes and a nice flavor tickles your taste buds. The goodness of Methi leaves, the flavor of mango ginger ..yumm..is a perfect recipe for a sumptuous meal. I got very few words to describe this dal..eating this dal sums up in as many words..here is how I prepare.. In a pressure cooker boil toor dal and methi leaves. *Updated - Take care not to use too much of coriander leaves as it might dominate the flavor and sideline the mango-ginger flavor. Enjoy every morsel of Dal-Rice with the flavor of mango-ginger tickling your taste buds! Deep fried snacks are always welcome at home. So on a weekend cloudy evening, I wanted some snack for the kids. Then I remembered that I had bookmarked this recipe by Vasavi Suresh. The original recipe called for bread crumbs instead of the besan batter. In fact I gave it a try. But after the first batch was done, I felt it was absorbing too much of oil. I also tried making some in the paniyaram/ponganala penam. But it didn't feel/taste the same like a comfort food should! But I am sure they would have worked like koftas in a gravy. (Never mind, we gobbled them too!!) So I quickly changed gears and converted them into bondas. Also I don't add green chillies when I know for sure I would be offering this to the kids. So feel free to alter the seasonings/spices as per taste. Finally I was happy with the bondas and all of us enjoyed a filling snack. Boil the mini farfalle as per instructions on the box. Drain and keep aside. In a mixing bowl, add the mashed potato, boiled mini farfalle, mirchi powder, salt, chopped onion and coriander leaves and mix them well mashing the pasta if required to get a dough like consistency. Make balls out of the mixture and keep them covered. Meanwhile prepare the besan batter adding water, ajwain and salt. Make sure the besan batter is not too runny. Gently drop the alu-pasta balls dipped in the besan batter one at a time and make sure the pan is not overcrowded. Fry them until golden brown and repeat the process until the alu-pasta mixture is done! We like to sprinkle a little Black salt (Kala Namak) on the bondas and some tomato ketchup by the side...yummy...some comfort food this is ...hmmm..
Sending it to the 'Bookmarked Recipes' hosted by Priya (Yallapantula) Mitharwal. This interesting experiment started when my neighbor gave us some collard greens on a nice evening. To be honest, I had never used collard greens so far and I was nervously cracking my brains as to how to use it up. I googled and read up material on how to cook these greens. But I couldn't find anything suitable to my taste. So I thought I would try preparing some dry curry by adding onion and tomatoes. But when I felt the rubbery texture of the greens after cooking for almost 10-15 min, I was a tad disappointed. I resisted my urge to throw it in the trash and quickly changed gears to prepare chutney out of it. Grinding the greens means I could avoid eating the rubber-like leaves. To my amazement, the chutney turned out to be so tasty that I couldn't have felt any better for not throwing the greens out! In all the confusion/nervousness, I didn't notice that these greens are very good for health (which greens are not, for God's sake?). Read the nutrition profile of these wonderful greens here and you will surely agree with me! Boil the chopped collard greens in about 5-6 cups of water for about 10-15 min and drain. In a heated sauce pan, add oil and the rest of the seasoning and saute until the mustard seeds start to pop. Add tomatoes to the seasoning and let them cook for about 3-4 minutes on medium heat. Afterthe tomatoes are tender, add the boiled collard greens and saute for 2-3 min. Switch off the stove and let the mixture cool. Grind the mixture with the roasted peanuts, tamarind juice and salt. The chutney is ready to be served with rice and ghee!! This chutney is off to Akila's 'Dish Name Starts With C' event. I have begun to appreciate the nutritive value in Barley only recently. Ever since I have been trying to sneak in barley into our menu. One such experiment led me to this. Since we all know that Idli is nutritious, I wanted to take it a little further. Thats when I got used to making idli with whole urad dal (the black gram without removing the black skin). Now the next step is to add some more nutrition to make it a multi grain idli. So I tried this combo of Urad dal (this time I just used the white urad dal! ), Rolled Barley Flakes and Rolled Oats. The results were not very surprising. I should say, I was a little disappointed(or flattered ?) when my dear husband couldn't tell the difference. I had to explicitly tell him that these idlis weren't the regular ones(He ate his normal quota of idlis and left without commenting!). So You all get the point, right..So sneak in these grains and say three cheers to good health! Soak Urad dal, Barley Flakes and Rolled Oats for 2-3 hrs along with methi seeds. Wash and soak Idli rava. Grind urad dal, barley flakes and rolled oats to a fine paste adding water as needed. Mix the ground batter with the soaked idli rava and salt. Keep the batter closed and in a warm place for fermentation. Care should be taken to put the batter in a big container as the fermented batter sometimes oveflows making a mess! It would take about 6-8 hrs depending on the room temperature. After the batter has fermented, mix well and if the consistency of the batter is not suitable, add water to the batter. Pour a ladle ful of batter on greased idli plates and steam them for 15 min. Serve with Peanut/Coconut Chutney and/or Sambar. Note - I am sure whole barley grains can be used too. But they probably need to be soaked for a longer time. After a long break, I got a big bag of quinoa the other day. So my experiments with quinoa resume! Thankfully, kids have accepted quinoa in their own way. Touch Wood!! Quinoa payasam tasted very much like rice kheer. (annam paramannam). My dear husband was confused when I told him that it was quinoa and not rice!! Here is payasam which can amaze one and all. Dry Roast the quinoa in a hot sauce pan and then pressure cook the roasted quinoa with 2-3 cups of water. Powder the roasted almonds and add it to the boiling milk. Mix in the boiled quinoa and let it blend well with the milk. Add Sugar and let it boil for about 4-5 min while mixing it, so that the milk doesn't burn. Optionally garnish with Roasted Cashew , Almond and Raisins. I didn't garnish as it is not preferred by the kids! Serve it hot or chilled as per individual taste. (We liked it both warm and cold). 1.Dry Roasting of quinoa is optional - only to remove the typical nutty flavor of quinoa. 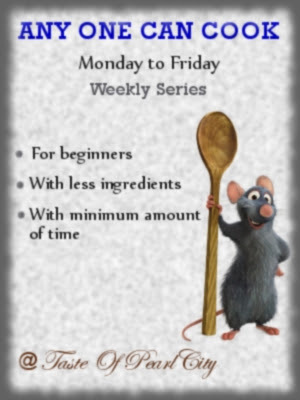 2.Pressure cooking is also optional. Quinoa can be boiled on the stovetop with the same amount of water. 3.To get a richer taste quinoa could also be boiled in milk - Is anyone ready to try this out yet? 2..'Only Festive' event hosted by Khaugiri and initiated by Pari. 3. 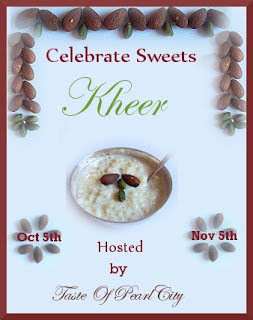 'CFK - Festive Foods Sweet /Savory Versions' event hosted by Suma and started by Sharmi. 4. 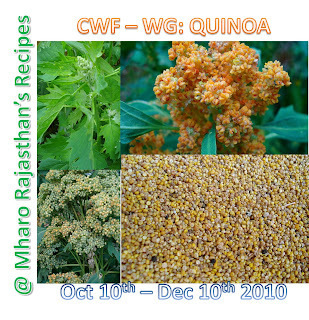 'CWF-WG - Quinoa' Event hosted by Priya Mitharwal. For a long time now, I have been looking for a delicious recipe using mango pulp and flax seed in making cup cakes. My search ended when I saw this recipe. The results were amazing..The kids loved it and we did too. I stuck to the original recipe for the most part except some minor tweaks to suit our taste. Instead of a quick bread I baked them as cupcakes. All this started when my 3 yr old started hounding me to bake cup cakes for her. So I then remembered that I had bookmarked this recipe earlier and so started the process. Believe me, she was following me up every 5 min until I served her the cup cakes! Thanks to my 3 year old, we enjoyed this delicious cupcakes. The dried fruit bits mingled with mango and banana flavors added to the taste. In a mixing bowl, mix all the dry ingredients so that there are no lumps. Make a mixture of banana puree , mango pulp, sugar, oil and water. Mix in the wet ingredients into the dry ingredients and add the dried fruit bits. (I added papaya and pineapple bits). Gently mix so that the dry and wet ingredients are blended in well. Prepare the muffin plate by placing the wax paper cups. Pour the batter into the cups and bake for about 20-25 min. (I pulled out mine in exactly 20 min). Cool them on a wire rack and enjoy after 5-10 min! Besan is a perfect ingredient for so many delicious sweet dishes and has always been my personal favorite. Be it Mysore Pak or Seven-cups burfi or Besan Chakki, all of them look almost the same yet have a distinct flavor of their own. 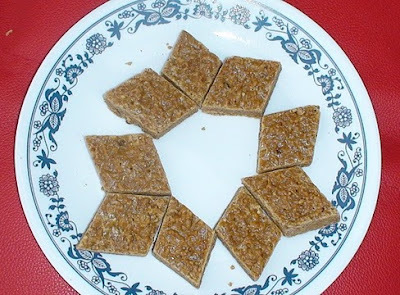 Besan Chakki or Besan Burfi is a very common North Indian sweet dish which can be made with several variations to it. You could make it richer by adding dry fruits to it or just enjoy the goodness of besan as is. My husband has been pestering me for this sweet but I never really got to actually make it for him all this while. Finally, he had to ask his mom to satisfy his craving and she so-ever willingly made this last week to see it disappear in a few days. Heat ghee in a wide bottomed pan, and roast the Besan on medium heat till the raw smell of besan disappears and it turns a light golden color. Add the khova/khoya to it and mix it well to remove any lumps in it. Meanwhile, take sugar in a separate bowl, add about ½ cup of water to it and boil it for about 7-8 mins or till it reaches a thick 2-string consistency. Slowly, add the Besan-Khova mixture to the sugar syrup and keep stirring it continuously till it forms one big mass and the ghee oozes out of the mixture. Spread it onto a greased plate and cut it into pieces before it cools down and enjoy. Note - Instead of greasing a plate, I found pouring the mixture on a parchment/wax paper lined plate better and easier to manage! 1. 'Only Festive' event hosted by Khaugiri and initiated by Pari. 2. 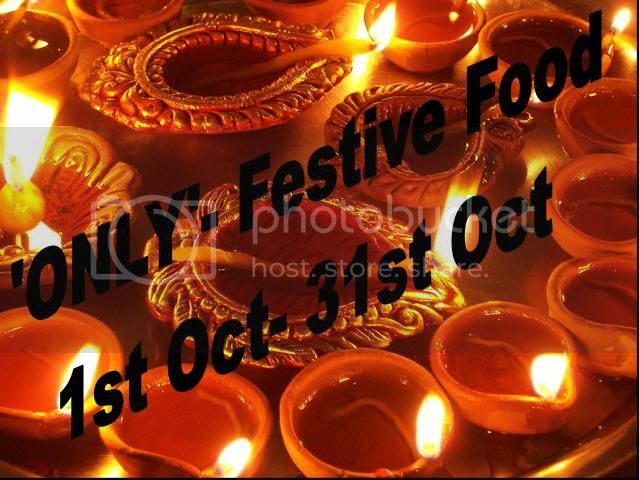 'CFK - Festive Foods Sweet /Savory Versions' event hosted by Suma and started by Sharmi. 3. Anyone can cook - series 3 hosted by Umm Mymoonah. I was looking at some international vegetarian cuisines and came across this Brazilian Orange Rice. Thats when I came to know that Brazilian staple food consists of Rice, Beans and of course meat. Also there are quite a few vegans out there and I found this recipe here. I have never experimented with Orange Zest (Grated orange peel). So I was looking at some recipes which demanded orange zest and found this one and this kind of suits our diet in that it is vegetarian and is rice based :) So check this out for a change. Also this was the first time I used pine nuts in my cooking..the crunchy pine nuts mixed with rice was a new experience and a very enjoyable one at that! The orangy aroma filled our kitchen while this was being cooked and it tasted just as flavorful!! Combine Rice, Salt, Olive oil, chilli powder, garlic powder, brown sugar, orange zest and water and cook in rice cooker. This can also be done on the stove top but cooking in the rice cooker is hassle free for me! Toss in the pine nuts and give a gentle mix and serve. I served it with Raitha as we are used to that combo! Be creative and serve it according to your taste. I garnished with some orange pieces.